As far as the late seventies British hi-fi scene was concerned, many overseas audiophiles must have been praying for us in our darkness. The UK hi-fi press was obsessed with Linn’s Sondek LP12. This deck was (is) without doubt superb, but contrary to what the hi-fi hacks of the day would have you believe, it was not the only ace black vinyl spinner available. 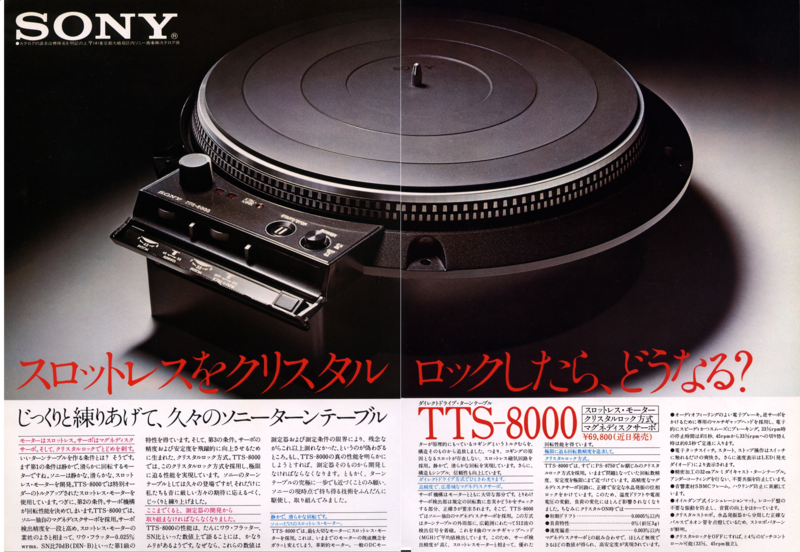 In fact, the period of 1977-1980 was nothing less than The Golden Age of Japanese Turntables. Marantz TT-1000, Technics SP10, Denon DP2000, Micro DDX-1000, Pioneer PL-70L, Kenwood LO-7D, Nakamichi TX-1000, Onkyo PX-100M, Diatone LT-1 – stunning feats of mechanical engineering, all. These mostly direct driven quartz-locked machines cost astronomical sums (often four times the price of a Linn LP12), at a time when the Yen was one third of its value today. Do the sums – we’re talking about turntables with absolutely no expense spared. These were the ultimate expression of the designer’s thoughts on the particular problematic of extracting information from a microgroove LP record. And the UK hi-fi press, God bless it, barely batted an eyelid. Such was the hegemony of the LP12. Amazingly, if you trog around Tokyo’s record shops in Asagaya, Shinjuku or Shimokitazawa, even today you may find one of these decks doing sterling service. Most likely sporting a dog-eared SME3009 S2 (it still is “the best tonearm in the world” if you believe lots of Japanese audiophile anoraks), these machines will still invariably be revolving at thirty three and a third RPM with exactly the same infinitesimally small wow and flutter figure as they had when the left the factory a third of a century ago. There’s no consensus as to which machine is the crème de la crème of Japanese superdecks, but the machine you see before you is probably it. Sony’s TT-S8000 is an audacious display of pure, undiluted engineering excellence. Everything about it is absolutely right – and it shows as soon as you set eyes on it. The motor unit locks into the separate plinth by four Allen bolts, which is the first example of this deck’s over-the-top approach to construction. The reason is that at 20kg (for the motor unit alone), gravity’s pull does a very good job of anchoring it down. The plinth is made of an inert, dead, concrete-like material and adds an additional 20kg to the total mass. Inset into the plinth is a large recess for an armboard. Underneath, four rubber feet support the table-bending weight. The 38cm platter carries stroboscope indentations around its perimeter for 33.3 and 45RPM – as far as DD decks go it again weighs a tonne. The frontally mounted controls offer instant ‘touch sensitive’ start and stop operation (the platter spins up in fractions of a second, as per all self-respecting Jap esoterica) and power on/off. In flap that lifts to reveal switches for quartz lock on/off and +/- 6% pitch – as per all late seventies direct drives, vari-speed was de rigeur due to broadcast/transcription pretensions. Inside lurks a brushless, slotless motor the size of which you’re unlikely to see outside laundry-grade washing machines. A quartz signal is referenced against the actual speed of the platter, which is sensed by a tape head counting magnetic pulses imprinted on the platter’s inner rim. The result is a Technics SP10-beating 0.015% wow and flutter figure. The sound of this thing is amazing. Its bass blitzes anything to come out of the UK during that period, with a solidity, grip, power, weight and slam that has you wondering what has happened to your speakers. Further up, a clean and open midband with a soundstage of architectural precision lends the deck its reference tag. Treble is open, smooth and uncluttered. True, the Sony TT-S8000 does sound a tad ‘matter of fact’, lacking the LP12’s joie de vivre, but in almost every other respect it completely bests it. Unfortunately, decks of this type aren’t exactly ten a penny, and you’re unlikely to find one down your local Cash Converters for a tenner. Should you ever find one, make sure it starts and stops properly – the only known weakness is the touch sensitive control with can fail with age. Think in terms of thousands of pounds, and start your search in Germany, which took far more than the UK simply because its audiophiles remained receptive to the joys of Japan during this very special period.